If you missed today’s seminar Pursuing conservation potential of public participation in scientific research with Jennifer Shirk, Project Leader, CitizenScience.org, Cornell Lab of Ornithology’s Department of Program Development and Evaluation, it’s available online. Have you ever thought of growing pawpaws? Pawpaw is a native fruit with a tropical fruit-like flavor that has been described as a cross between a banana, mango and pineapple. They are rarely found in markets because the fruit is easily damaged when ripe. Cornell Cooperative Extension of Seneca County is offering a Pawpaw Production Workshop on Wednesday evening, November 6, 2014 from 6:30 pm to 8:30 pm. The workshop will be held at Vince’s Park at the intersection of Rt 314 and Rts 5+20 in Seneca Falls, NY. Steven Gabriel, from the Cornell Small Farms Program and owner of Wellspring Forest Farm in Mecklenburg NY will be the presenter. 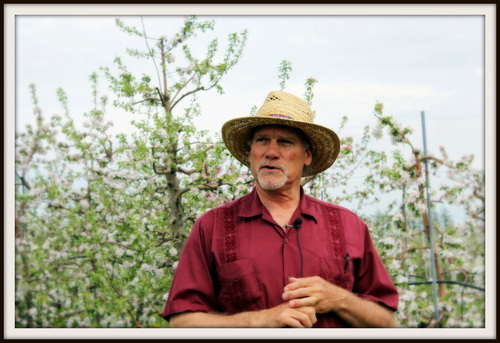 Steve has recently co-authored a book called Farming the Woods with Cornell professor Ken Mudge. 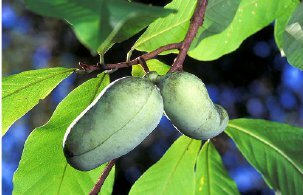 The workshop will cover various topics related to growing pawpaws including pawpaw management, site selection and sourcing pawpaw trees. 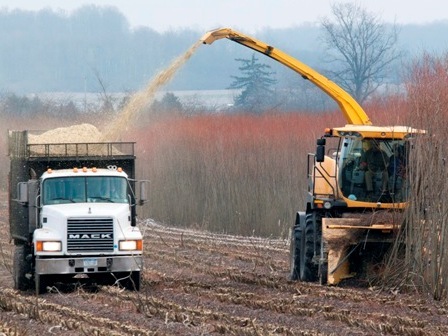 Larry Smart is among the presenters at the Willow Biomass Energy Short Course, Nov. 18-19, SUNY College of Environmental Science and Forestry, Syracuse N.Y. The two-day conference includes classroom and field training in sustainable production and multiple end-uses of shrub willow for heat, power, & environmental benefits! See willow harvesting equipment available through the NEWBio equipment access program (www.newbio.psu.edu) in action at commercial willow operations and NEWBio demonstration site in northern New York. More information: Willow conference website. Or contact: willow@esf.edu or 315-470-6775. With 4 days left, Cornell Plantations Internship Program is $2,500 shy of its $10,000 goal. Help push them over the top. Part 1 of the program will be held at Cornell Orchards, located on Route 366 in Ithaca across from the College of Veterinary Medicine parking lot. 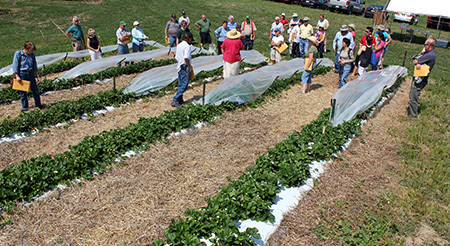 Part 2 of the program will be held at the East Ithaca Farm located just around the corner from Cornell Orchards on Maple Ave. A refreshment break will be provided between program sessions. The open house is free and open to the public but pre-registration is required to ensure adequate transportation, handouts, and refreshments. Please register by phone or e-mail by contacting Cathy Heidenreich, mcm4@cornell.edu, 315-787-2367 no later than Friday, September 26 30, 2014. Full program line-up and more information. Professor emeritus Ian Merwin was featured in a Travel Section article in yesterday’s online edition of The New York Times, Sips From a Cider Spree in New York State. Relay teams hope to squash their competition at the first Big Red Pumpkin Regatta on Beebe Lake Saturday, Oct. 4. Hosted by Cornell Flotilla, a graduate student club, racers will decorate their giant pumpkins at noon, while the paddling starts at 2 p.m. The racers must be out of their gourd – or, actually, the racers must stay in them. Five teams each with four people will have enough room in a 300-pound pumpkin to fit a single paddler. In a relay, the paddlers will race 100 meters four times around Beebe Lake. The grand prize: bragging rights. 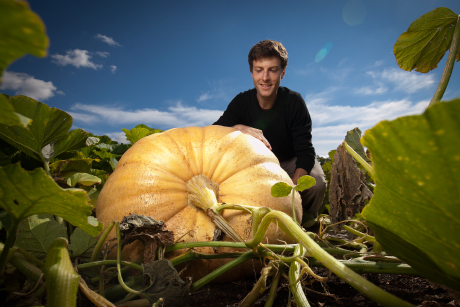 Since the spring, Peter DelNero, a graduate student in the field of biomedical engineering, and his club colleagues, have been lovingly cultivating giant pumpkins (Cucurbita maxima) on several acres of the Dilmun Hill student organic farm. “I can’t wait to get out into the pumpkin boats. It’s going to be a riot,” says DelNero. How’d it work out? See A tradition is born: the Big Red Pumpkin Regatta [Cornell Chronicle 2014-10-07]. Would you like to get more involved with Cornell’s student-run farm? Consider joining the Dilmun Hill Steering Committee. Application deadline is October 3. The Steering Committee, a small working group of dedicated Dilmun Hill undergrads and Organic Farm Coordinator Betsy Leonard, facilitates governance. This committee formed in Spring 2008 due to expressed need for greater transparency and coordination of the site. The work of the committee enhances the work of the Student Club at Dilmun, and also manages logistical and administrative needs implicit in running a farm, coordinating a variety of volunteers and collaborating with Cornell administration and departments. Membership on the committee is open every semester to undergrads, and one graduate or a non-student/community member position since they also comprise an active element at Dilmun. The Student/Faculty/Staff Advisory Board, comprised of four faculty/staff members and four Steering Committee alumni, facilitates policy making for Dilmun Hill. Submit your written application by October 3rd to Betsy Leonard, bai1@cornell.edu. Go on a journey with a group of high school students seeking solutions to climate change. 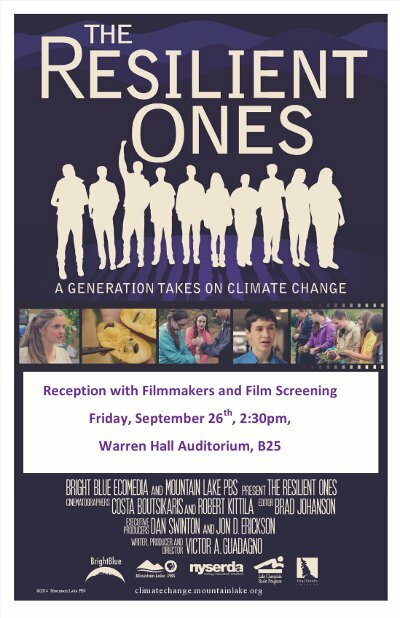 The Resilient Ones invites you along to meet with the local leaders and expert innovators as these students work to make a difference in the Adirondack mountains of Northern New York. Cornell Professor Ken Mudge, Research Specialist Jonathan Comstock, and extension educator Steve Gabriel make brief appearances. Friday, Sept. 26th, 3:00 – 4:00 p.m.
Short reception with food & drink starts at 2:30. Immediately followed by Q&A with filmmakers and local individuals featured in the film. Saturday, Sept. 27th, 7:30 p.m.
55 min. run time and Q&A with Filmmaker Victor Guadagno and individuals featured in the film immediately following. If you missed today’s seminar, Case studies in forest farming, with Ken Mudge, it’s available online. And don’t forget to pre-order his new book, Farming in the Woods.